The host nation for this year's climate talks is pumping the brakes on one of its most successful ways of controlling carbon. France, one of the world's leaders in low-emissions nuclear energy production, may soon diverge from the path that brought it there. The French get more than three-quarters of their electricity from nuclear power, the largest share of any country in the world. This atomic largesse from its 58 reactors -- second only to the United States' 100 reactors -- has made France the largest net electricity exporter on Earth and provided cheap electricity to its residents. The world’s major producers of nuclear power -- a major source of emission-free electricity -- are moving in different directions to replace their aging plants. The United States and France are experimenting with newer, more trouble-free models, while Germany is abandoning the technology. According to the Nuclear Energy Agency of the Organisation for Economic Co-operation and Development, France consumed 495 terawatt-hours of electricity, generated 551 TWh and exported 47 TWh in 2013, the most recent data available said. This generation mix has averted 31 billion metric tons of carbon dioxide emissions. However, in fulfillment of a campaign promise, President François Hollande's government is aiming to pass legislation in July that will cement a nuclear energy drawdown, bringing nuclear's share of generation to 50 percent by 2025 in an effort to diversify France's energy production as the country adopts new targets for cutting greenhouse gas emissions. The move is a drastic shift for one of France's iconic industries. "Nuclear was sort of proof of the greatness of France," said Bernard Laponche, a French energy consultant who helped develop France's first generation of nuclear reactors. "It became a source of national pride, and there was never a strict separation between civilian and military affairs." After testing their first nuclear weapon in 1960, the French turned their infrastructure for enriching and processing uranium toward energy. The country doubled down on its nuclear bet after the oil crisis in 1973, convinced of the acute need for energy security built on a domestic source. The decision was decreed from high levels in government and civil service. The French experimented with their own designs but settled on an American reactor and rapidly built them throughout the country, which in turn provided some of the cheapest electricity in the European Union while maintaining an admirable safety record. The nuclear sector now employs 220,000 people, generating 2 percent of France's gross domestic product, according to the French Foreign Ministry. Arnulf Grubler, a researcher at the International Institute for Applied Systems Analysis in Austria, wrote in a 2010 paper published in the journal Energy Policy that France's success in nuclear energy stemmed from establishing a standard design for reactors, centralized decisionmaking and certainty that the government was committed to nuclear power. 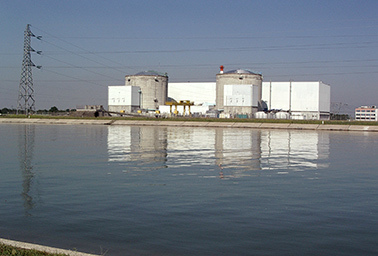 Fessenheim, France's oldest operational nuclear power plant. Photo courtesy of Wikipedia. These factors meant France could build reactors faster and operate them cheaper than just about anyone. More than 76 percent of French reactors were built in less than seven years, while less than 35 percent of American reactors were built that fast. The French nuclear build-out is estimated to have cost about $330 billion, yielding a levelized cost of energy of 5 cents per kilowatt-hour. On the other end of the supply chain, the French decided to recycle their nuclear waste, drastically cutting down on disposal requirements. A family of four over 20 years would generate a 35-millimeter film canister's worth of nuclear waste. The French government now holds 90 percent of shares in Areva, the firm that builds nuclear reactors, and 85 percent of Electricité de France (EDF), the utility that operates them. For a time, the strategy paid off for France, helping make it the second largest economy in the European Union, behind Germany. However, some miscalculations and market shifts have put the industry in critical condition. Once enough reactors were built to meet demand, the construction sector went into stasis, with decades elapsing between builds and upgrades. "EDF's once formidable institutional know-how seems to have atrophied providing a good example of knowledge obsolescence as a result of an extended period of no nuclear construction experience," Grubler wrote. In addition, nuclear plants, by their nature, are big bets and take years to build. Laponche explained that the French nuclear industry anticipated 1,000 TWh of demand, but domestic needs have yet to top 600 TWh, leaving an oversupply. With the economic downturn and increasing energy efficiency, French electricity demand has remained level or declined in some instances. Now, some of France's reactors are showing wrinkles -- France's oldest reactor, Fessenheim 1, started operations in 1977 -- and officials need to decide whether to invest in costly safety upgrades to keep them operating or to decommission them, another expensive prospect that leaves open the possibility that fossil fuels may rise to meet the shortfall. New reactors also are struggling. Areva's third-generation nuclear reactor, EPR, is now under construction at four sites: two in China, one in France and one in Finland. All four are behind schedule, and the French and Finnish reactors have seen their costs more than double, suffering from quality control and management problems. "The cost of construction of new nuclear is extraordinarily expensive," said Antony Frogatt, a senior research fellow at Chatham House, an international affairs think tank. He observed that there are ways to extend the lives of existing reactors, but upgrades get progressively more expensive, and certain components, like reactor pressure vessels, cannot be replaced, so renewed operating licenses are only prolonging the inevitable. And while France has reduced nuclear waste, it hasn't eliminated the need to dispose of it. No country with nuclear power has a viable underground repository for waste, and proposed sites in France face public opposition, despite more widespread support for nuclear power. On the other hand, France is the second largest renewable energy producer and consumer in Europe. Wavering solar and wind power don't play well with baseload nuclear plants that prefer to run at full blast, so the French must find a way to cope with this imbalance if they are to meet the European Union's directive to generate 20 percent of their electricity from renewables by 2020. Will fossil fuels fill the gap? The French energy agency ADEME recently issued a report finding that it is technically and economically feasible for France to switch to 100 percent renewable energy by 2050, though distributed renewable energy is a direct threat to the nuclear utility's business model. All the while, low prices for fossil fuels like oil and coal are undermining incentives for clean energy deployment. "To sum up, it's a shrinking client base [for nuclear power] and a competitive market," said Mycle Schneider, an independent international energy consultant. "The financial and economic situation is devastatingly bad." The New York Times reported that Areva hasn't been profitable since 2010, accrued €4.8 billion in losses in 2014 and may lay off up to 6,000 workers. EDF may take over parts of Areva's business. Areva declined an interview for this story but expressed support for France's energy shift in an email. "This law is a balanced text that comprehensively addresses energy questions without opposing energy sources against one another," wrote Areva spokeswoman Katherine Berezowskyj. "Securing the increase in the share of renewable energy by maintaining a major share of nuclear energy in the electricity mix corresponds perfectly with AREVA's ambitions." EDF did not respond to requests for comment. With climate change looming larger as an energy concern, France's nuclear drawdown is raising eyebrows. "It is a bit ironic the one advanced economy that has decarbonized its power grid would choose to put that in reverse," said Armond Cohen, executive director of the Clean Air Task Force. "It seems like there is a lot of optimism about the ability to fill that gap." To stop catastrophic climate change, the world will need to drastically cut emissions from power generators in the span of two decades or so, Cohen noted. France is one of the few precedents for such action. With the world converging in Paris later this year to hammer out a climate agreement, nuclear energy proponents like China and skeptics like Germany are keeping a close eye on France to see whether the French experiment will vindicate their approaches to energy. Can the next generation of reactors spur a nuclear renaissance?